“You have the best job in the world” is a phrase I’ve heard more than once and, for the most part, I agree. The hours are awesome, the working conditions are the best and the perks are completely insane. The pay is...lol. And my weight quickly approaching “On this special episode of ‘Oprah’” territory, but it’s worth it. Get ready to drool. A lot. I’ll be the first to tell you that it is bonkers unfair that I get to do what I do while other people have to dig ditches or fill ditches or complete paperwork to explain why so much conflicting ditch work is going on. But even though my daily grind is generally super wonderful, there are days when it goes above and beyond. There are days when I wake up and look at the clock and will the hours to go faster so I can get up and go. That’s what happened on the day I got to review Pie Junkie. Can we all take a moment to talk about how much we love Oklahoma? This state is our home and we care deeply for it. Sometimes that care means deep levels of frustration with Oklahoma’s lawmakers or people who are too heavily invested in college football to function in polite society, but we are still ride-or-die for this state. I say this not to denigrate others, but rather to make my feelings about Pie Junkie clear. Pie Junkie is not good. Pie Junkie is not “Oklahoma good.” Pie Junkie is freaking phenomenal. That pie shop could set up a kitchen in any state in the union and people would be just as impressed. Give it up to owners Leslie Coale-Mossman and Darcy Schein and their staff of pie savants, because they deserve it. They put in the work (and boy, do they work) and the results are clear as day: Pie Junkie makes the pie I crave. Let’s be honest — when you think about Pie Junkie, you think about dessert. It’s okay. I’m the same way. Pies are, by and large, the domain of after-dinner sweets. But I would be remiss if I started this review off with anything other than Pie Junkie’s triumphant savory quiche. Quiche is much more than scrambled egg pie, though I’m not averse to that variety. The eggs in a true quiche have a more homogenous texture. A custard that, like Weebles, wobbles but doesn’t fall down. That’s what you’ll find at La Baguette and it’s what you’ll get at Pie Junkie. They sausage quiche was masterful. The distribution of the sausage was even through the quiche, giving every bite that savory, spicy bite. 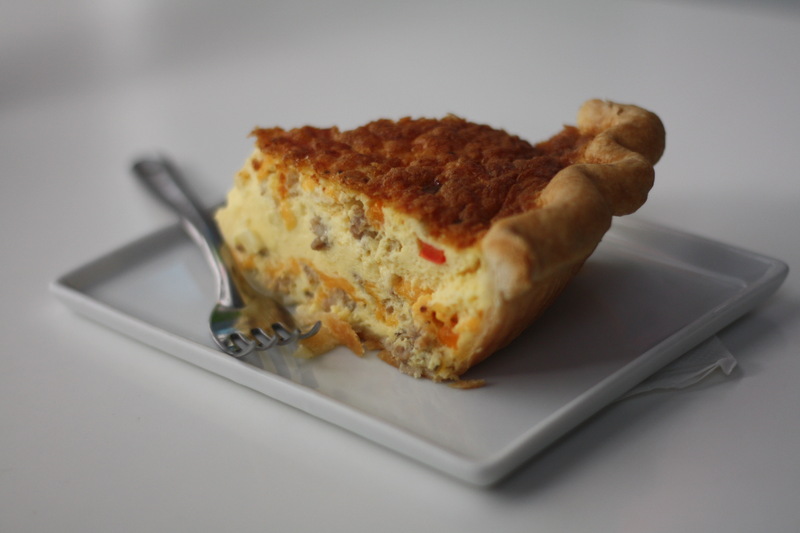 Pie Junkie uses Blue & Gold sausage, because it’s the best, and makes the quiche irresistible. Pie Junkie’s best seller is the Drunken Turtle, which is really saying something when you consider how rich and filling this pie is. There’s no second slice of Drunken Turtle. It’s a meal unto itself. 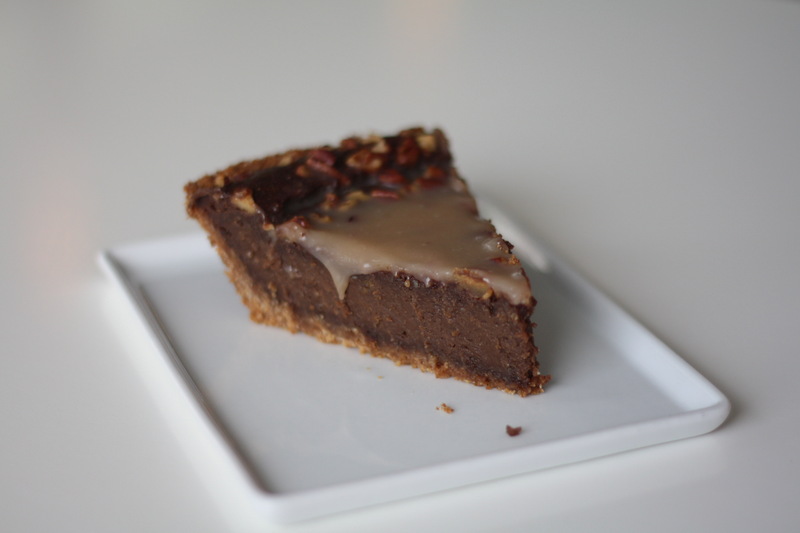 The bulk of the pie is a fudge-like chocolate filling that sits perfectly stable atop a graham cracker crust. A layer of salted bourbon caramel covers the top of the pie along with a smattering of pecans. This pie is rich. This pie doesn’t even look at price tags when it shops. It just points and says, “I’ll take three” and wanders off while the assistant’s assistant gets out the credit card and pays. This pie is a big fan of the Trump tax bill. Big, big fan. For you, dear readers, I persevered. Despite the luscious and filling Drunken Turtle, I stepped up to Pie Junkie’s Key Lime and got served. Key lime brings the pucker. This isn’t a Mrs. Field’s key lime pie. It has some serious citrus bite and a tart pucker that stopped me cold in my tracks. Balanced with an enormous scoop of whipped cream, this pie was simply heavenly. 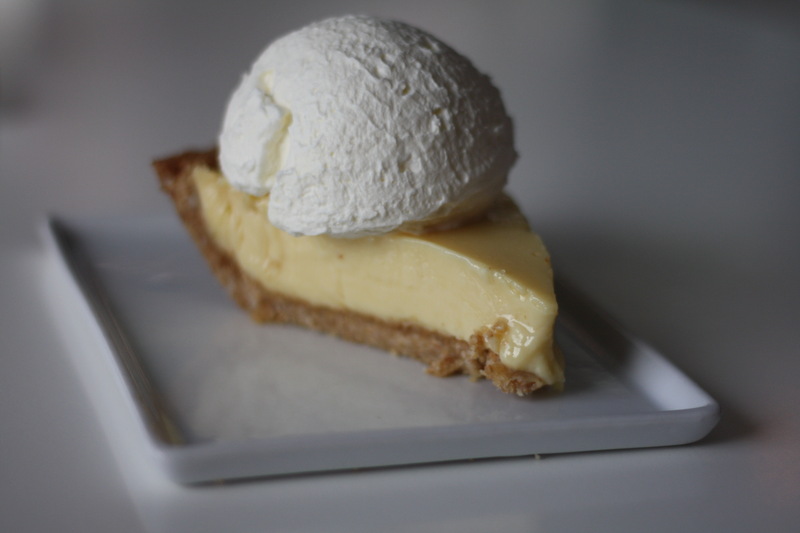 The key lime is sour and sweet in equal measures and the filling is exceedingly smooth. Did someone just unhook your bra? Yeah. It was this pie. That’s how smooth it is. The graham cracker crust is a marvel. Somehow it’s tender enough to crumble in the mouth but sturdy enough to hold together after being forked apart. Really wonderful. 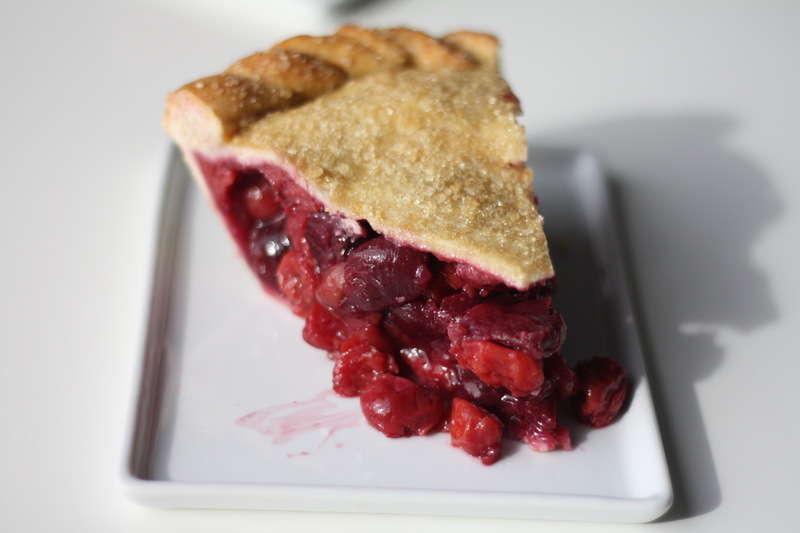 Tart Cherry Pie is only available on Tuesdays, so I recommend you go in on a Tuesday. “Just be ready, because we use real fruit,” Darcy and Leslie told me. No canned pie filling-style cherries here. This slice of heaven is stuffed full of honest-to-god cherries and really really real cherry flavor. Real fruit in the Tart Cherry pie. The top layer of crust is finished with a rough sugar, giving it a sparkle and some added sweetness and crunch. Definitely worth getting a scoop of ice cream alongside it, btw. Finally, my nemesis: Red Velvet. Quick story. When I was a kid, my mom would bake or buy a cake for my and my brother’s birthdays. For some reason, she couldn’t remember if I was the one who liked red velvet cake or if it was my brother. So on his birthday, she’d get red velvet and he’d be happy. On my birthday, she’d get confused and get red velvet. And he was happy. Not so much me. 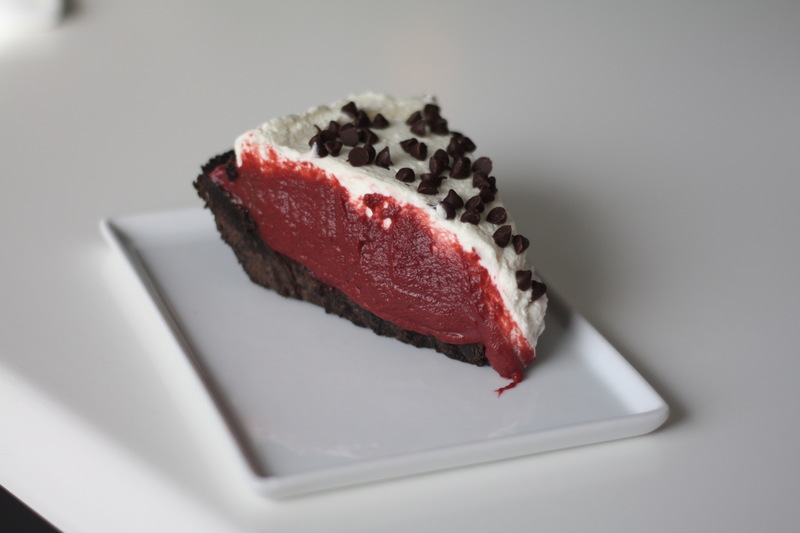 I’ve made peace with red velvet in the years hence and I could definitely see a future with Pie Junkie’s Red Velvet pie (their January special, so get it while you can). Similar to their chocolate silk, the red velvet uses more cocoa powder than chocolate, giving it more of a hot cocoa flavor. Sitting on an Oreo crust, the filling was smooth and decadent, but not so rich that it stops you from eating more. I’m a fan. But that’s true of everything at Pie Junkie. I love the people. I love the ’50s aesthetic. 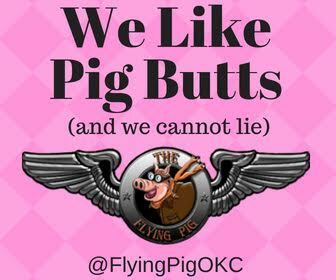 I love that there’s a restaurant in Oklahoma City dedicated to pie and that it’s good enough to go up against any other pie in any other state. YOU HEAR ME, KENTUCKY? YOU BRING A PIE AND SEE WHAT’S UP, YOU PUNKS! Sorry. I’ve had a lot of sugar. Probably ought to balance it out with more quiche. 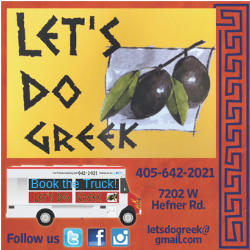 Tue-Thurs 10 a.m.-7 p.m., Fri-Sat 10 a.m.-9 p.m.